That was a part of one of Indonesian national songs, which I really like as it shows a pretty scenery of Indonesia with some coconut trees bowing down slowly or dancing to the left and right harmoniously because of the wind. The scene of a wide range of green coconut trees never fails to amaze my sight. Not only does it amaze my sight, but it also feels my soul with so many good things in life to cherrish, bad things to be the food for thoughts coming in between. 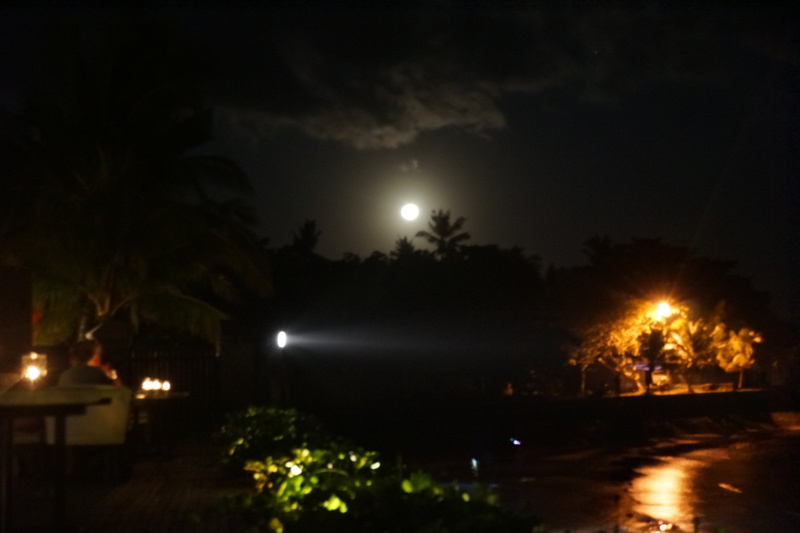 I was just sitting there one night on the floor of our great bungalow looking up the sky lightened up by the moonbeam while hearing the sound of the waves on the beach not far from our mansion. 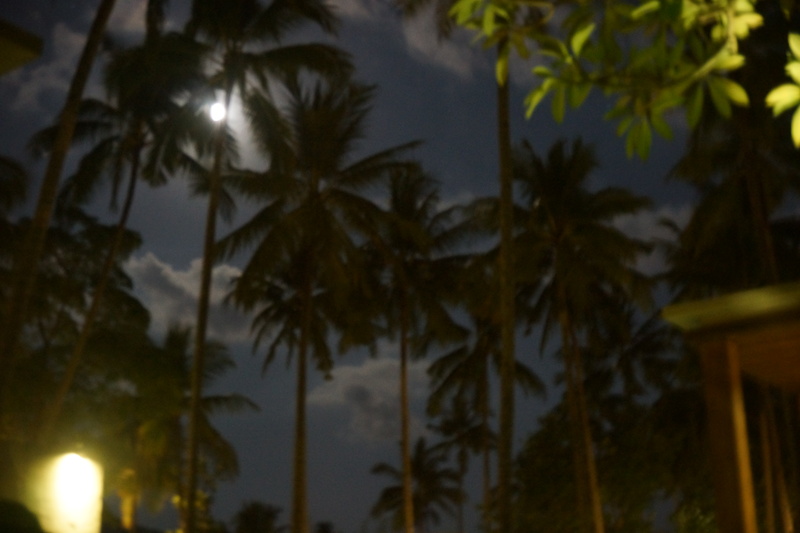 The moon was peeping up behind the coconut trees that looked like they had been sleeping already some hours back then. I nailed to the floor, and could not move watching the beauty in front of me, above me! It was all so beautiful that I wanted to relive the moment by writing it. I remember going back to our mansion after a free buffet dinner, and seeing some clouds coming their way blocking the moon. I was trully hoping that the moon would not be shy showing herself to me that night. She wasn’t! She kept her promise to show her beauty to us that night. I was hypnotized by her light. I had hoped that I could just lie down on the bathroom floor just to see you dissappear from my sight or until I fell asleep as I was mesmerized by your beauty. I have been feelling poetic lately, most especially when I am on the situation like the above I described. Coconut Trees along the path to the restaurant and the beach. The mansion located on Candidasa Bali, Indonesia, was one of the gifts in life that I needed to cherrish by always remembering it, reliving it so that I will not forget how lucky I am to have been able to witness all the beauty with my family. When we are on a holiday in a tropical island, which is so far we choose one of the islands in Indonesia, my homecountry, I always suggest my husband that we stay in a place with shaddy trees, greenery shelter. We love nature, and we try to avoid staying in a touristic area. You know, seeing coconut trees is something spectacular to me now that I live in Germany with almost no coconut trees anywhere to be seen. 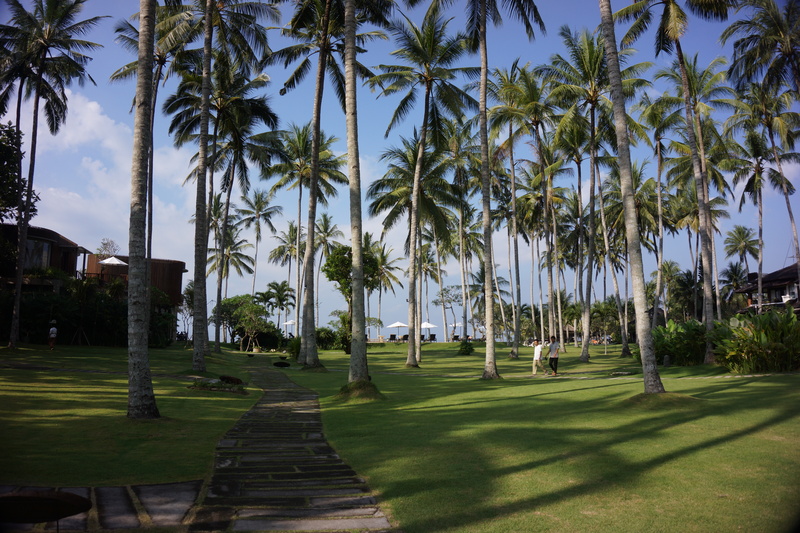 The mansion we stayed was very greeen, a lot of coconut trees with the background of a green hill too. The mansion is far from what people call as hectic and touristic area. This was what we were looking for! we had some space for ourselves. We wouldn’t be rushed by city tour going here and there. Not that we do not like exploring the city more often, but once in a while we just needed to sit back and relax, and enjoy the nature in our own way. By the time we arrived there, Candibeach Resort and Spa was doing some renovation on its restaurants, so we got a free buffet dinner, which was a great benefit for us for we did not have to go out to look for food. The selection of the buffet dinner was quite varied. They had different menus every night, only that the Indonesian dishes were not their speciality. But overall, the menu was good. The drinks are considered a bit pricey in my opinion. Many people who often go to Bali do not know where Candidasa is. But, I honestly think that I love the eastern part of Bali. And told be truth, I am not really interested in going to Sanur or Kuta or Legian where nature is almost impossible to enjoy. The mansion as I prefer calling it that way, made me feel close to the nature. Something that I call as a relaxation! I have nothing to complain about the location and the view around the mansion. Please stay tune on my blog to read more of the detailed reviews on inside the mansion, the new spots we went to during our visit on Bali. Meanwhile, close your eyes and fly with me to witness the beauty I shared with you here! Alhamdulillah! 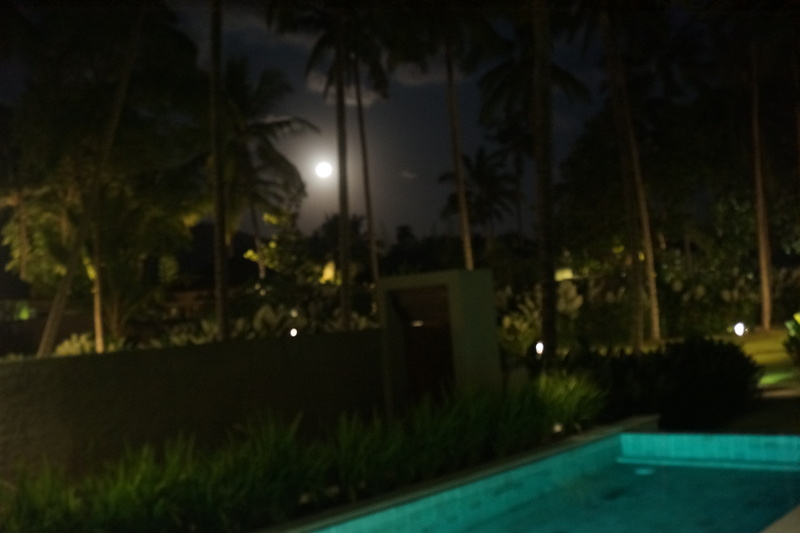 The moon was peeping behind the coconut trees seen from our mansion. The view from the front part of the resort. The path going to the restaurant overlooking the beach. The spot in font of the restaurant overlooking the beach. They have some chairs and tables there where you can enjoy your meals while looking at the beach. The view taken from our bathroom glass door. I really like this.. I have a mental image of such things…and places. I feel my soul escapes to such beauty and serene places… Thank you for sharing! I know Jim!, I still feel the moment every time I remember these scenes. You’re welcome! I love sharing it. Glad you like it! terhibur lu liat foto-foto disini terutama foto pantainya. Iya mbak suara debur ombak bikin kangen begitu sampe Jerman. Mudik gak kemana2 juga seru kan mbak?